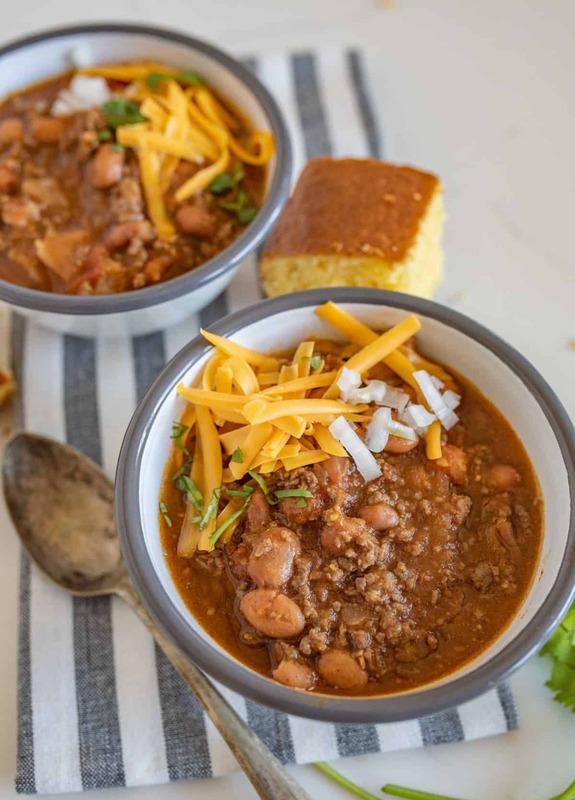 Quick and easy slow cooker chili made with all the classics like beans, tomatoes, and ground beef, plus two other surprising ingredients that will add tons of flavor with no extra work. 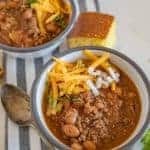 Slow cooker chili is my favorite! 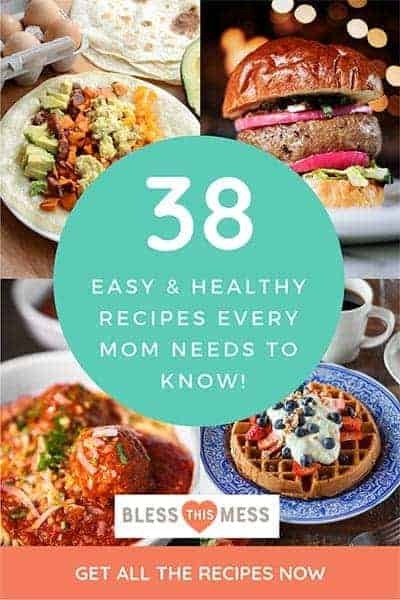 Dump in allll the things, let it sit on your counter while you read books to the babies, clean up messes for the millionth time (because there’s always something to clean isn’t there?! ), run kids back and forth, and maybe even sneak in a nap. 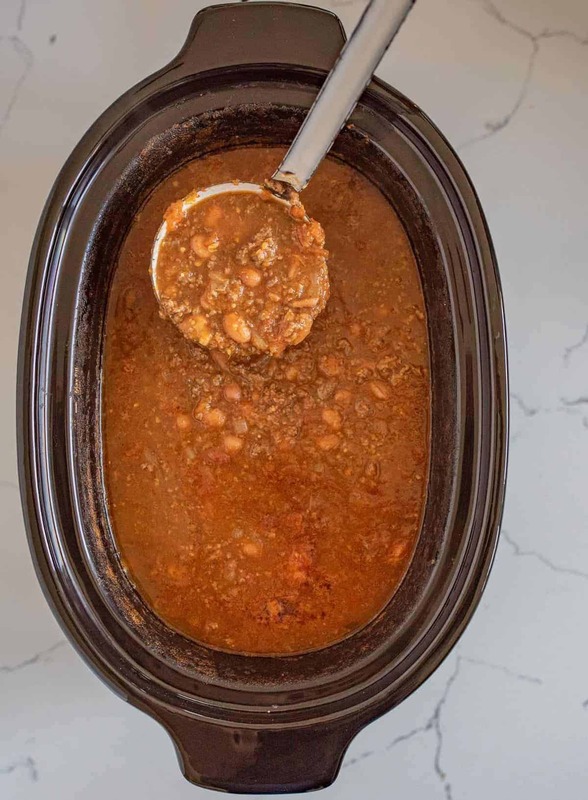 I love and use my slow cooker all the time and chili is such a great option in it. You know how chili is normally better the day after you make it? Well I feel like making chili in the slow cooker gives it that time it needs to mix and mingle, making the flavor so good. I also love chili because it’s a meal that my kids can customize at the table. If you’ve been around Bless This Mess long, you know I love it when family members can make a dish their own. There are so many things you can top a bowl of chili with! 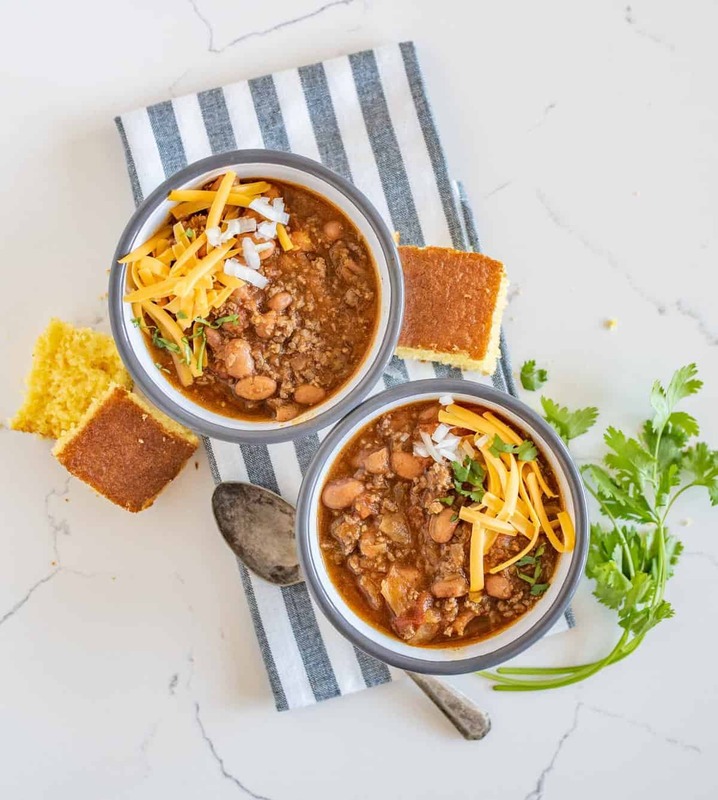 We love finely diced raw onion, diced green onion, cheese, sour cream, hot sauce, pickled jalapenos, fresh chopped cilantro, oyster crackers, and cornbread (here’s my all-time favorite tried and true cornbread recipe). No matter what you top it with, it’s sure to be a simple easy dinner that practically cooks itself. Now that’s something to cheer about! You can use other ground meats such as chicken and turkey or even ground elk or venison for this recipe if you like. I have tried letting the meat cook in the slow cooker (without browning it first on the stove). It worked fine but it left all of the grease in the chili which I didn’t like. I love using green salsa in this recipe because it adds a great depth of flavor without extra work. If you like it hot, find a hot salsa. If you like it more mild, be sure the salsa reflects that. If you aren’t sure how much to add, try the lesser amount and after the cooking time you can always stir more into the pot. Pumpkin is my favorite secret ingredient for chili. 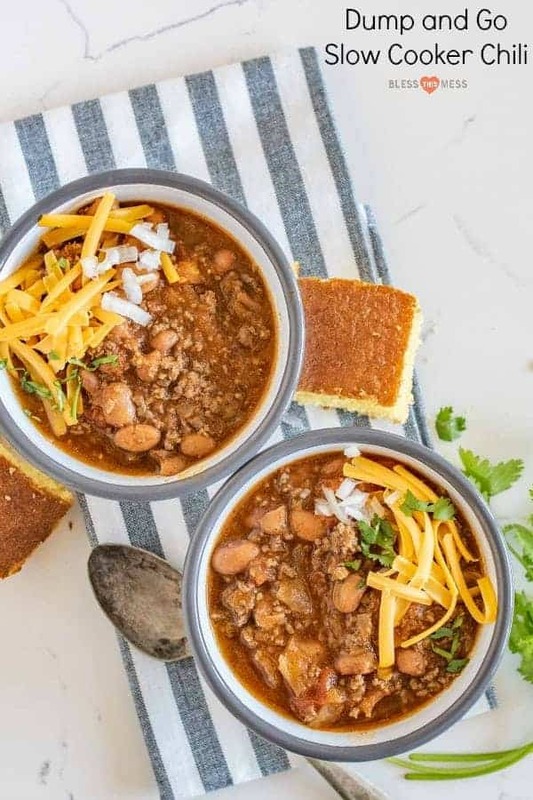 It adds a subtle sweetness and thickens the chili nicely without adding a pumpkin flavor. You are going to love this trick! 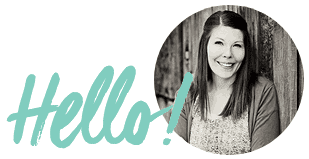 I love to cook dry beans in my instant pot. If you can find cranberry beans, they are great in this recipe. 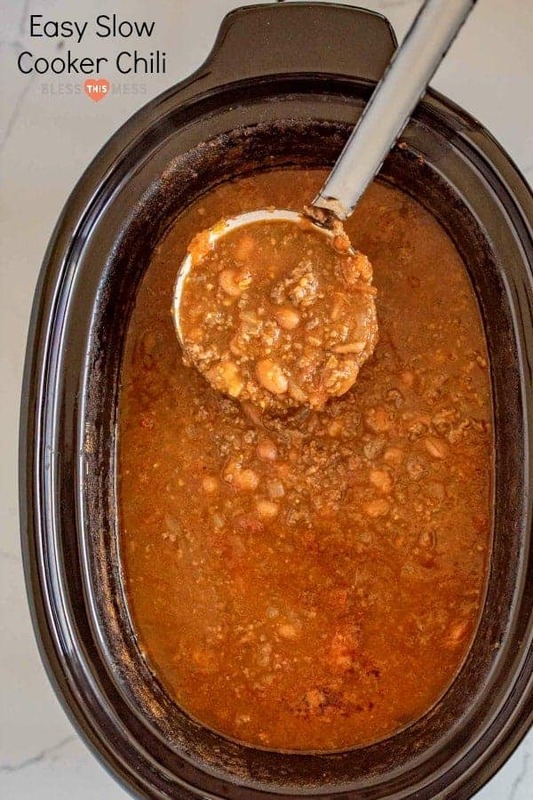 Got leftover chili? We love it on top of baked potatoes later in the week. Makes a quick second meal out of one that you’ve already cooked. I have this slow cooker and love it – works great and it’s only around $50. In a medium skillet over medium high heat, add the ground beef and onion. Cook until the beef is cooked through and no longer pink. Drain the excess grease. Add the cooked meat mixture to the base of your slow cooker. Add the pumpkin puree, green salsa, chicken stock, diced tomatoes, chili powder, cumin, paprika, garlic powder, and salt. Stir to combine well. Before serving, adjust the seasoning to taste and add additional salt and pepper as needed. Serve hot with optional onion, shredded cheese, hot sauce, and/or sour cream. You can use other ground meats such as chicken and turkey or even ground elk or venison for this recipe if you like. I love using green salsa in this recipe because it adds a great depth of flavor without extra work. If you like it hot, find a hot salsa. If you like it more mild, be sure the salsa reflects that. If you aren’t sure how much to add, try the lesser amount and after the cooking time, you can always stir more into the pot. So many chili recipes to love including some great meatless ones that we make often. Enjoy this easy recipe from my kitchen to yours! Thanks for the great recipe! I made it for Halloween even though we are now a household of 4 adults. It was great to have something simmering while we answered the door to 100+ trick-or-treaters. We all loved the chili. The only thing I did differently is to add a 15 oz. can of tomato sauce because I love tomato-y chili. This was super easy to put together and everyone was surprised there was pumpkin in it! Loved it, thanks for yet another great recipe!